Nintendo built a legacy in the 80s and 90s, and has spent the rest of its history closely guarding that legacy. Succinctly, the thing that buoys the gaming giant through its various hardware flops isn’t the value of its intellectual property (which is vast)—it’s nostalgia. Even the most committed Nintendo fans can admit the company’s bubblegum cast of characters don’t change much. Each console represents a chance to recycle (or iterate on, depending on who you ask and the game in question) the same franchises, the same mechanics, all with the purpose of preserving a feeling of continuity and attachment to a player’s first experience with those characters. 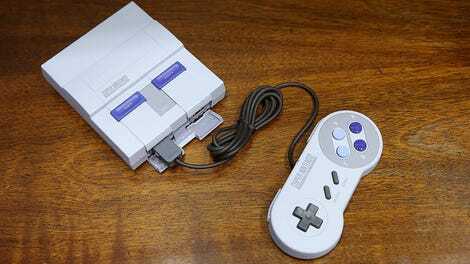 A tiny SNES with 21 games on it. Hitting reset to get to the menu. For plenty of people, the NES provided that first frantic run through a Mario game or the bewildered exploration possible in Metroid. My gateway was the SNES. With the SNES Classic, Nintendo follows up on last year’s micro-sized nostalgia console with a 21 title-deep roster of greats. This of course, includes the much-hyped and technically unreleased Star Fox 2. (Complete versions have circulated through ROM-sharing sites for years.) Why two Kirby games? Why Final Fantasy III instead of Chrono Trigger? There are minor decisions to gripe about, but the selection serves as a curated snapshot of what made this console great. Physically, it’s an almost perfect replica of its namesake, only smaller, and with the same red power-on LED visible in the seam where the two plastic halves of its shell meet. The console portion is slightly shorter than the controllers themselves. At one-sixth the size of a standard PS4 and with a cheap plastic cover guarding the controller ports, I found myself thinking of it alternatively as cute or chintzy and still haven’t quite made up my mind. What it can boast with certainty is that it’s a bargain. $80 may seem steep for such a small package, but the list of games would cost nearly double if you bought them on Nintendo’s Virtual Console. Let’s not even go down the road of tallying up a collection of these games on working cartridges. An original Earthbound can easily sell for over $150. Limited quantities of the NES Classic led to massive aftermarket inflation, and Nintendo has urged consumers not to overpay for the SNES Classic, even if it is very hard to get your hands on one immediately. I agree—this isn’t worth hundreds of dollars. Some people will absolutely pay that much anyway. But heck, playing Yoshi’s Island on a replica SNES controller just feels... right? Even if controllers since 1990 have done more to take ergonomics into account. The only thing missing from the overall experience is that satisfying katchunk of wedging a cart into the top of the machine. As with the NES Classic, the “reset” toggle returns players to the main menu where you can save progress at any point during gameplay—which is massively counterintuitive to anyone who played one of these things. Remember when “reset” was the thing a younger sibling would fiddle with, ending hours of progress? New to this mini-console is the ability to rewind through save states. During the five days I spent playing the SNES Classic I barely used rewind. Having to pop back out to the menu and down to the save slots, open another screen... keep it. If the feature were accessible in-game, what a joy it would be. Getting up to toggle reset over and over was more frustrating than dying repeatedly in Castlevania IV. Adding rewind in-game would of course require adding extra buttons to the controller, which would undermine the veneer of authenticity. But the SNES didn’t output to HDMI, either. The SNES didn’t let you rewind. Difficulty, and in some cases outright unfairness, was what gave a game replay value 25 years ago. In the end, the SNES Classic is great fun, and if these games mean something to you—or you’re a serious collector of Nintendo products—the SNES is worth the price of entry. Otherwise, your money is best spent cherry-picking from the Virtual Console. 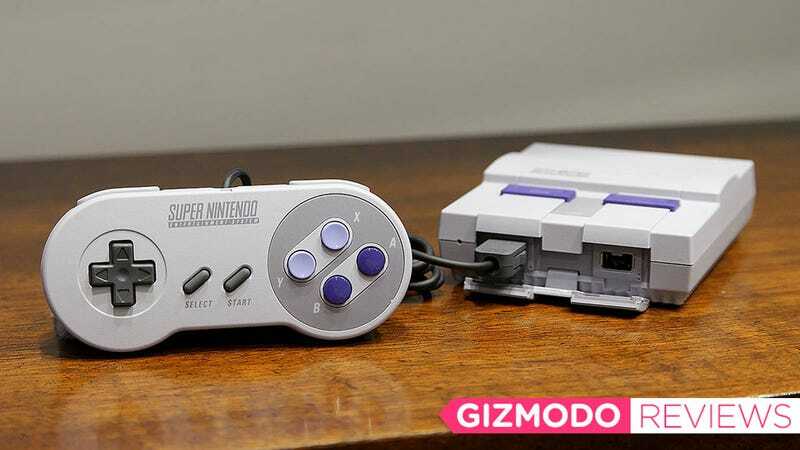 Two controllers, and longer cables make the SNES Classic almost playable from bed, unlike its NES predecessor. It launches with a solid games library which can’t ever be expanded. I will never get over hitting ‘reset’ to save. $80 is a fair price for the best way to play these games other than the original console. Buy two for when you snap the console in half after hours of getting destroyed in Super Ghouls ’n Ghosts. Star Fox 2 is just OK.